I can’t stop Bermuda grass, therefore: I hate it. I am solar powered: sunshine is a necessity for me. I need a 12 step program for my obsessive seed collecting. No. Really. I need help! To be fair, I have seed from when I lived in Colorado and most of it doesn’t like Texas. 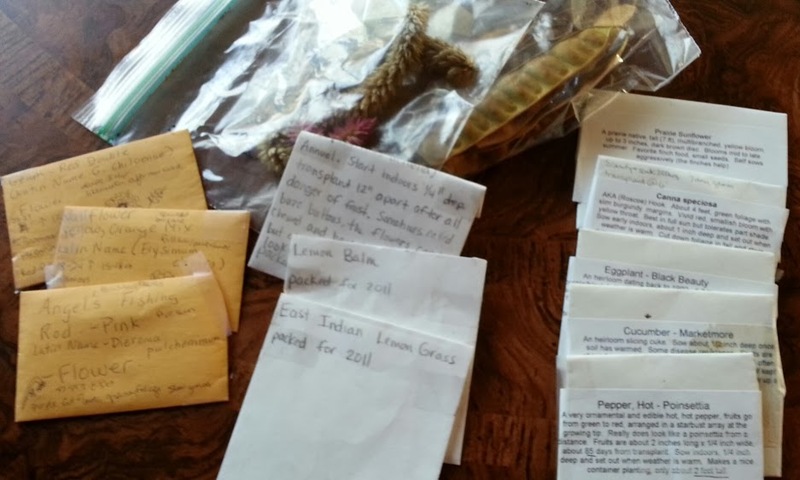 I was also on a seed train where we sent seed around all over the country and shared our favorites for the price of postage (I haven’t been on it for the last two years.) 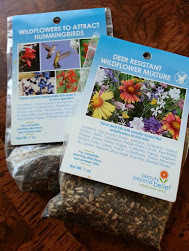 I am also known to strip seeds or starts from plants I like at the zoo or parks…or my neighbor’s plants as I’m walking (and then guiltily run back to the sidewalk with my FREE treasures!) 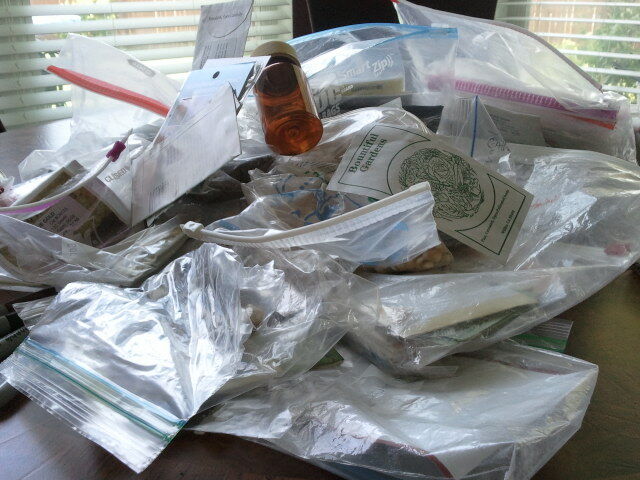 But even with that all taken into account: I have a seed collecting issue. I would like to state now that I haven’t bought seed in 30 days and have forced myself to refocus my attention on what I already have, which is a lot. The problem with my seed collecting is: I haven’t really found a good way to stay organized. 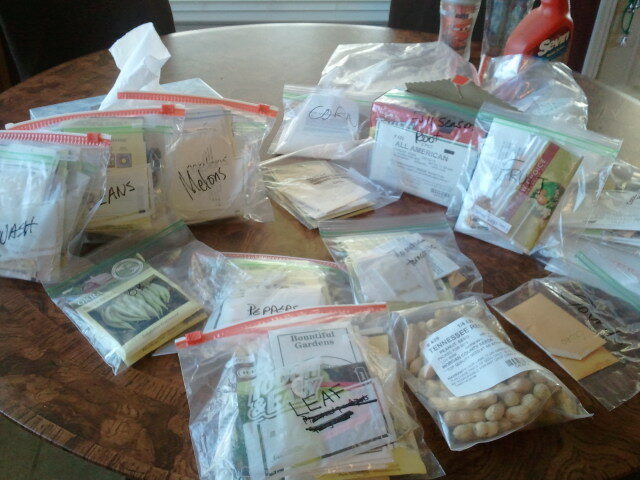 Every spring I am hunting through ziplock bags ferreting out seed packages that have nothing to do with the bag’s label. I suppose I need a better labeling system. Or maybe less seed. No…I’ll stick with the idea of labeling issues. Are you starting to see my problem? Organized and ready to misplace them as I plant again. 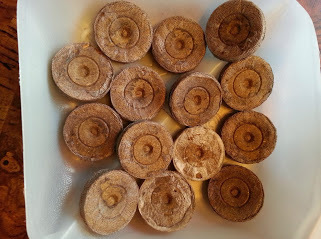 So now that I’ve explained my personal seed saving issues, I would like to share some of my growing experience. I’ve mentioned I don’t have a huge budget for my gardening. I do a little every month and over the years I change my yard. The best place to start (once you’ve officially decided to try your hand at growing your own inexpensive plants) is deciding how much you are willing to spend versus save. I do not have seed sprouting equipment like grow lights and heating mats. (So if you are a beginner at seed starting: I have about the same equipment as you.) I seem to always have enough windows (with indirect but bright light) and nice days, to skip most of the expensive stuff. This was true even in Colorado. I really don’t need much, and even if I did, I would argue that there are inexpensive ways to do everything. My seed trays are outside right now soaking up our 78 degree day in February. (Ahh. I love South Texas.) When I need heat, I put my seed trays on top of the refrigerator, when I need light I find a window to provide it. 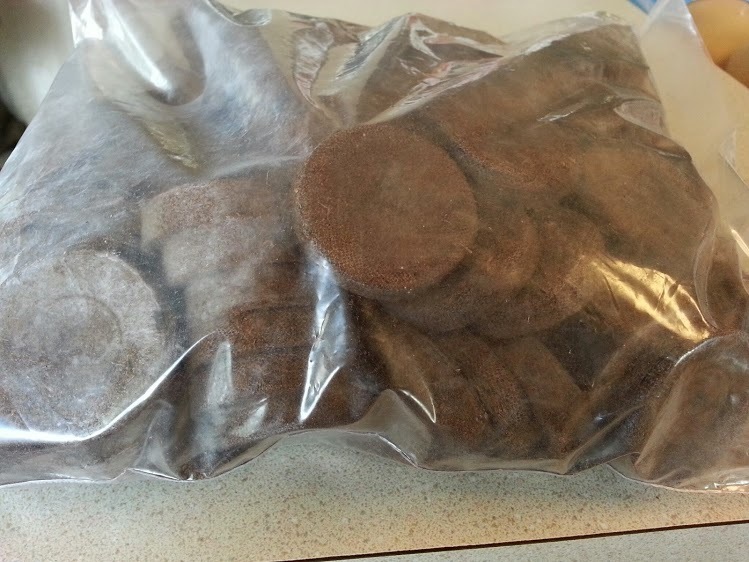 My granny, who lives in Kansas (which is seriously cold in the winter), always used trays of home sterilized soil. Her grow lights were just plain florescent tubes in a super cheap shop fixture. She hung it on hardware store chain and moved it up and down depending on how tall her plants were. Unless you are planning on growing your plants to maturity indoors, I don’t think you need to invest in expensive equipment. Another plus you and I have are endless ideas from the internet. My granny had to invent (or reinvent) everything she did with ideas from the local library in her small hometown or rely on her own ingenuity. What took decades to learn from trial and error can be avoided or sped up by linking into information on here from people willing to teach you what they know. Even with access to information, I am still struggling to try and figure out planting dates here, which are completely backwards from any place I’ve ever lived. I’m supposed to be direct sowing my sweet corn. In February. Really? I don’t question county extension planting dates anymore. I suppose seeing if it rots in the cool soil will be better than last year when I started my corn (when I thought I should) and then watched it burn up in the heat. I’m always going to be ahead in the season from most of the rest of the country, which helps me write this. Keeping an eye out for what I’m doing, will help you get your ideas ahead of when it’s your turn to try out the advice. In most places in the United States, winter is your down time. Here summer is the down time. 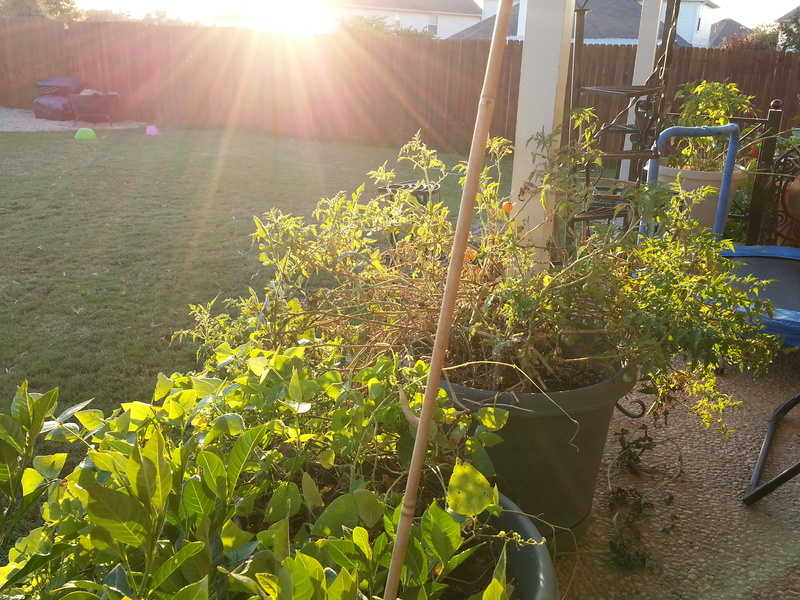 Winter is when you grow spring/fall vegetables and flowers. Spring/fall is when you grow summer vegetables. Summer is just hot as hell and only amaranth, hibiscus and okra thrive. It’s been very hard to switch this many growing zones and have it make any sense (zone 5 to zone 8b)! You’ve probably heard of starting seeds in milk jugs. If you haven’t, it’s pretty straightforward. 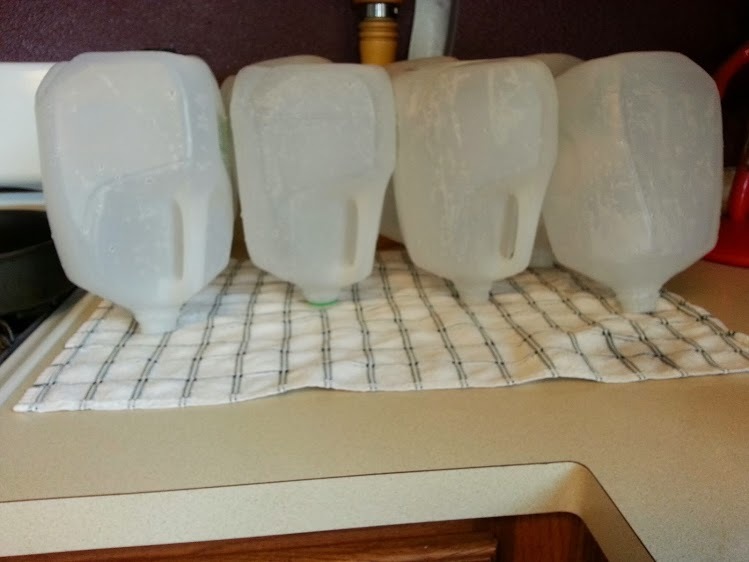 Save your empty gallon milk jugs and clean them out. Run water, dish soap and a teaspoon of bleach in your jugs. Put the cap on and shake gently over your kitchen sink. Rinse them thoroughly. I use the same bleach mixture as I am cleaning by pouring it into the next one before I rinse out the one I am working on. 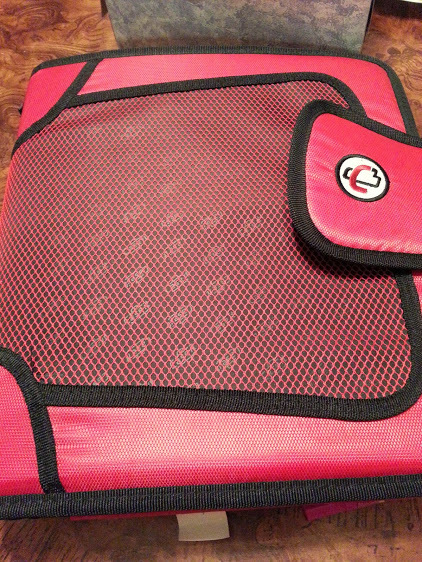 I also mark mine with a “C” for clean. My family helps me lose track of the clean ones by moving them around or stacking dirty ones in with the clean ones. To keep my stress levels down, I just mark them. That way my kids and husband don’t add more work to my project. Clean and marked with a C.
Turn them upside down to drain completely. Make sure you start with a clean, dry interior. If you are a perfectionist now is the time to peel the sticker off. (This is a totally unnecessary step.) Cut around the jug until all you have left attached is an inch or two under the handle. Don’t do this outside. The slightest amount of wind will make your jugs fly off your work surface. Even for photographing, I got frustrated with these and ended up moving them inside. I leave a deep well for the pots. The depth is up to you, and not particularly important, unless you are using a loose soilless medium (which I don’t recommend. See below.) You can use a needle (or your scissors or a sharp knife, if you do it carefully) to put some drainage holes in the bottom. If you use a needle pull it around in a circle to open the hole larger than the diameter of your needle. 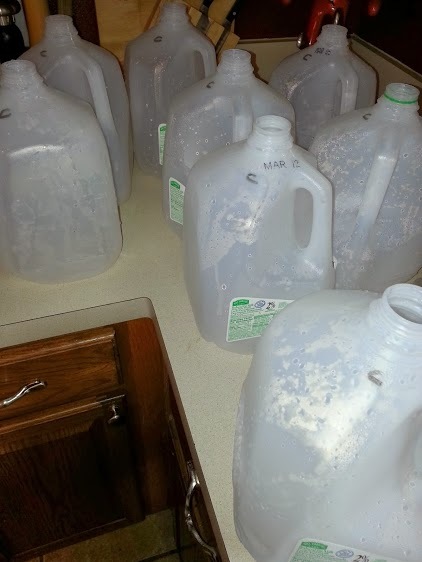 I have needed to occasionally water my jugs. 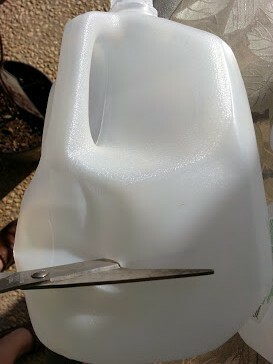 If you have the tape completely sealing the jug and no drainage holes: you won’t have an easy way to drain the jug if you get too much water in there. This is where I branch off and do my own thing. 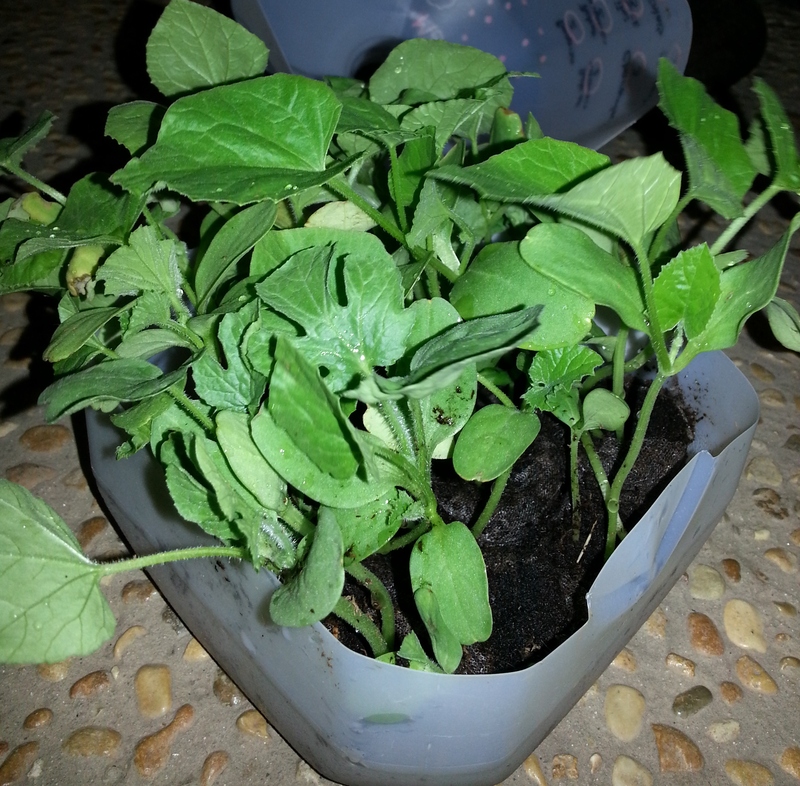 I use compressed peat pots for the seedlings. Milk jugs have a ridge in the bottom. This won’t matter once the pots expand. I love peat pots. 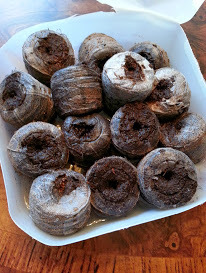 They are sterile, you can plant them directly out in your garden and most importantly you can separate them easily, so you can start different varieties and easily keep track of what is what. Water the peat pots until they expand. Tuck them back in if they have shifted. 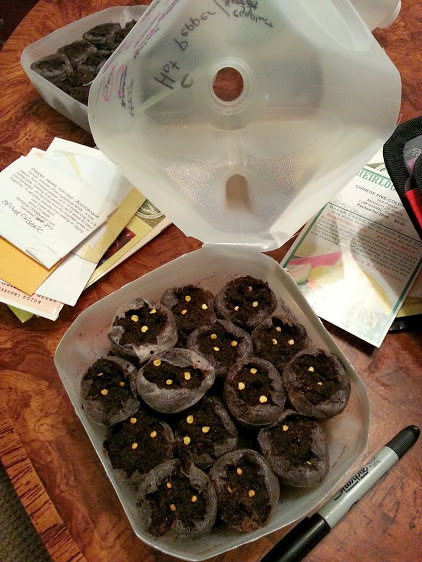 Open the top of the netting on the peat pots and place your seeds per the directions for the variety you are growing. 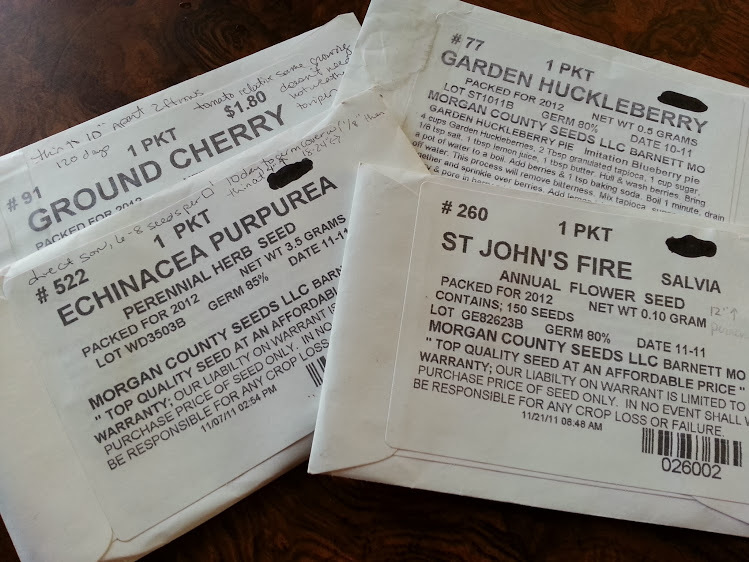 Mark your seed varieties as you go. I poke them down and cover them all at the end, just in case I get distracted and forget which ones I’ve filled. This picture is from the first year I tried this. You can see from the markings on the outside that I used soil and tried to keep track of the seedlings by an estimate based on the rows I started them in. It was a mess. I couldn’t easily separate the seedlings and I lost track of which rows were which. Plus if the jugs were bumped or knocked over the whole thing mixed together and the map on the outside was useless. The peat pots proved to be a much better choice. If you have experience starting seeds you know the importance of sterile soil. 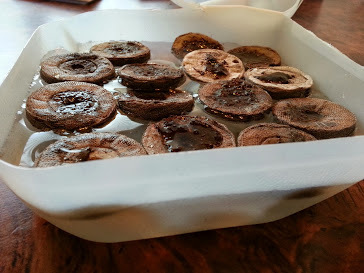 You can make your own (or just buy seed starting medium or peat pots) by heating potting soil in your oven (I do not recommend it because your house will smell like hot dirt. They don’t make “hot dirt” scented candles for a reason and it’s why you don’t see a link here on how to do it.) or your barbeque grill (don’t tell anyone else who uses the grill that you cooked dirt in there, especially if they don’t garden!) Here’s a link how: http://voices.yahoo.com/sterilize-garden-soil-barbecue-grill-11911441.html The main reason to do this is insects and fungus that can be in unsterilized soil. Once you have lost all of your big healthy tomato seedlings to the fungi that cause damping off, you will never use unsterilized soil again. 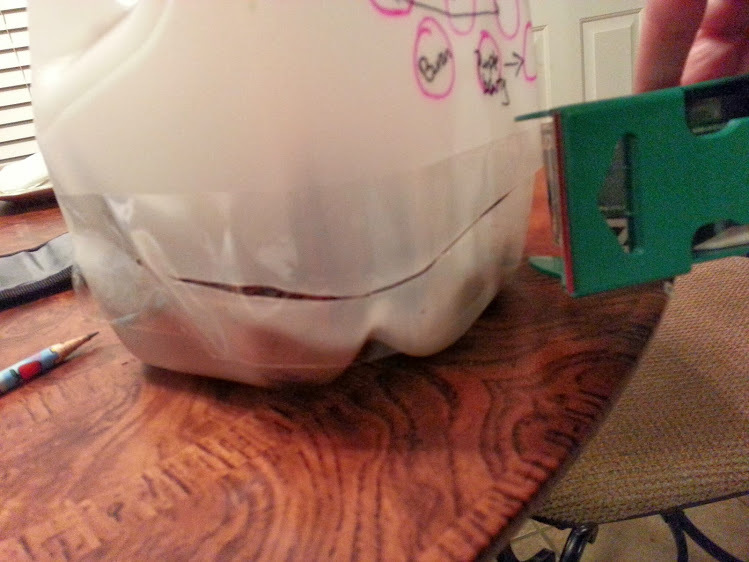 Next I seal up the jugs with tape. I have used both packing tape and duct tape. I don’t like duct tape because it’s harder to work with (It’s too sticky and hard to get off of the roll.) but it also creates a better seal. You can use either, just make sure the jugs are dry on the outside. 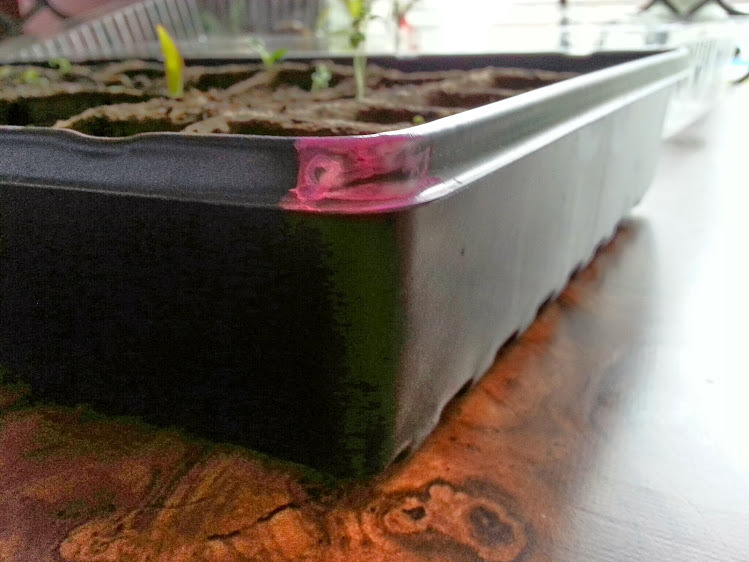 If you are using duct tape (or brown packing tape) make sure you leave room for the tape as you are marking your pots. It is frustrating to have to re-mark things because you have covered your map with opaque tape. Replace the cap. I followed directions from someone else the first year I did this and left it off. 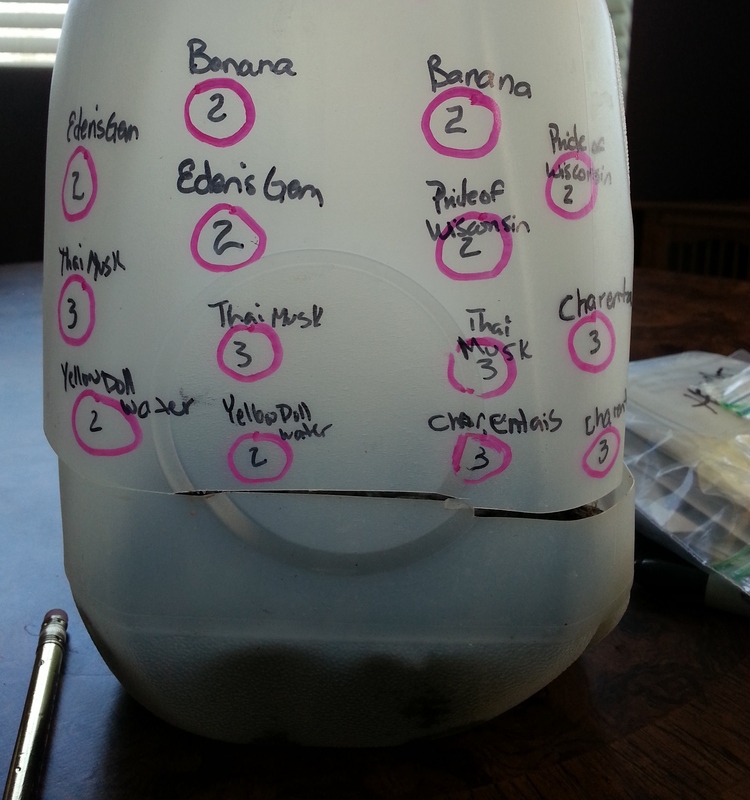 I ended up with gnats, fungus (damping off) and spidermites down inside the jugs. The spidermites and fungus decimated my seedlings and I ended up with gnats in the house if I brought the jugs in because of a freeze. These are very easy to move. I recommend bringing them in if it gets too cold. The jugs also dried out quickly. I will never do this with the caps off again. If you have lost some of the caps: tape the tops closed. I like the milk jugs better than the trays most peat pots come in because the seedlings can get much taller, older and they don’t dry out like the trays do. 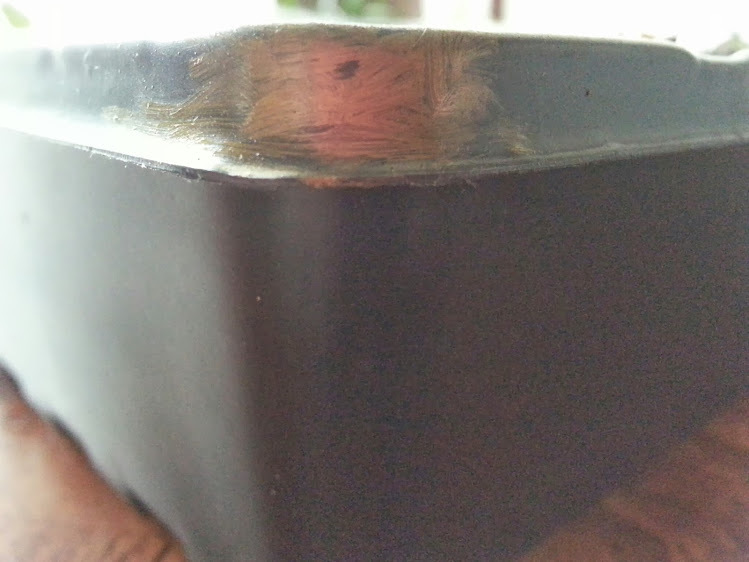 Jiffy sells peat pot refills in a small box. I couldn’t find any this year so I ordered a package of 100 off of Amazon. I also don’t like individual plant tags for seedlings. No matter how careful I am the tags drop out, get to the point I can’t read them, or both. This is where milk jugs are superior to trays. I make circles with magic markers or paint pens for the rows of peat pots with the names of the seeds. Usually 4 rows: 3, 4, 4, 3 are the amounts I can comfortably fit in milk jugs. You can keep track of trays by marking the base of the tray on two corners. I use two different colored paint pens. Mark the map you create in the same way. 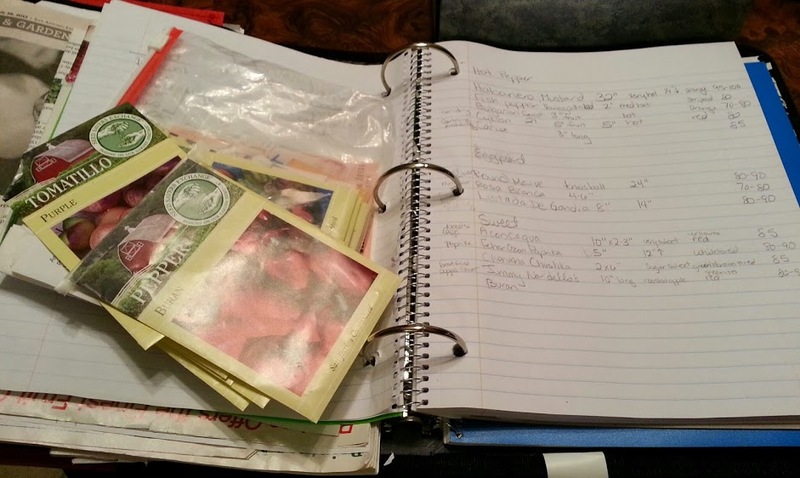 I also keep track of everything in a binder with pockets for plant tags and receipts and a spiral notebook to write in. This may seem like a lot for the beginner, but eventually it will be a great habit. 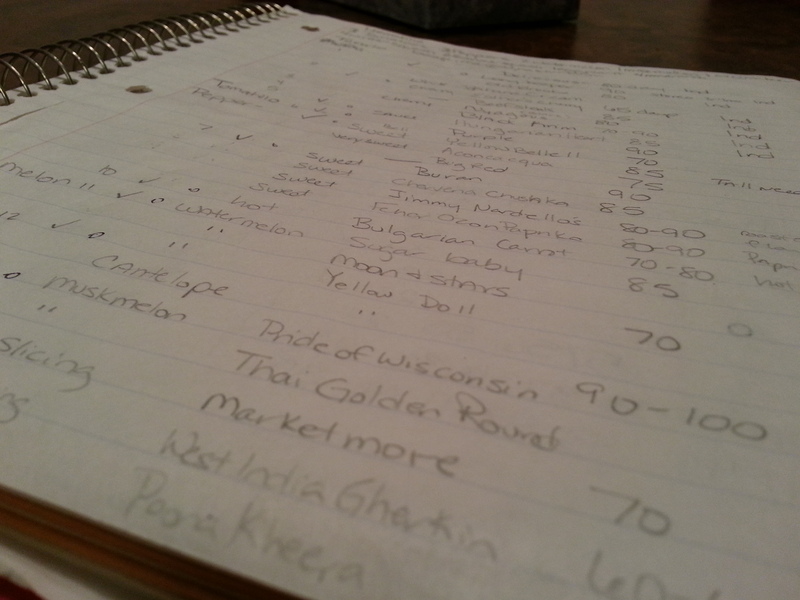 I write anything I would want to know when I transplant the seedlings. 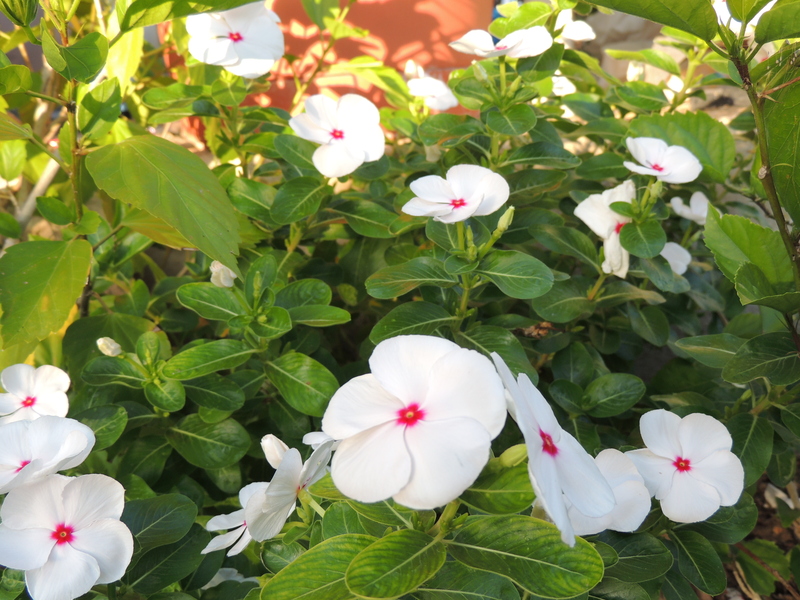 Such as: type, height, width, days to germinate, days to maturity and flower/fruit color. This is way more information than would ever fit on a tag and it’s simple. I like drawing maps for things rather than tags even after transplanting. 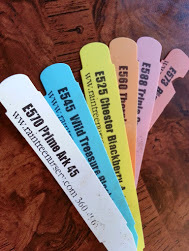 I haven’t found a cheap way to make lasting tags that can withstand sun bleaching, water and/or critters and kids knocking them down and moving them. My spiral notebook and 5 subject binder are always accurate and ready! I suggest moving things into larger pots in dappled shade for a while especially if you are working with perennials. Even with your best attempts perennials may be worth getting from the nursery. I grow perennials from seed but I still lose a lot of them to various things. I always start more than I actually need because of this. If I had an expensive set up, I’d probably lose less. I’d definitely lose fewer plants if all I was focused on was gardening, but that’s never been the case. I’m okay with the rate of loss relative to my investment in starting the seeds. The next step would be to put them out in the garden under row cover. Garden centers and big box stores sell this. Look in fall or early spring for white or black rolls of fabric. THIS IS NOT the same thing as landscape fabric and you can’t substitute these. The black will shade the plants and soil better. White will let more sun through and keep the soil heated. If you can’t find it locally: go online. If you really want to save some money and have something that will last several seasons go down to goodwill (or to the fabric remnant area in your local fabric shop) and find some thin very sheer fabric. It only needs to slow down the direct sun not stop it. Anything I put in the ground gets decimated by slugs and snails. I bury the row cover around the edges. Row cover serves two purposes for me: The plants don’t burn and I thwart the bugs. If you want to, you can really get a big system going. I mainly start seeds because I’m cheap and I hate spending tons of money on nursery plants if I don’t have to. That kind of negates the big system idea for me right there. The last advice I will stick in here is from my mom. She always said: “Buy your plants at Walmart. They are much cheaper than nurseries and it all comes off of the same truck.” As usual, my mom was right. You will find the best deals on generic plants at places that buy in bulk (this isn’t the best place for fruiting plants or anything specialized, though). The nursery tags are the same on plants from most places I visit around here. Which means they do all come off the same truck (or at least the same grower), but boy are they ever priced differently! It’s worth shopping around to find a good local nursery for advice and perennials. Quick fill-in annuals are Walmart or hardware store territory as far as I’m concerned! 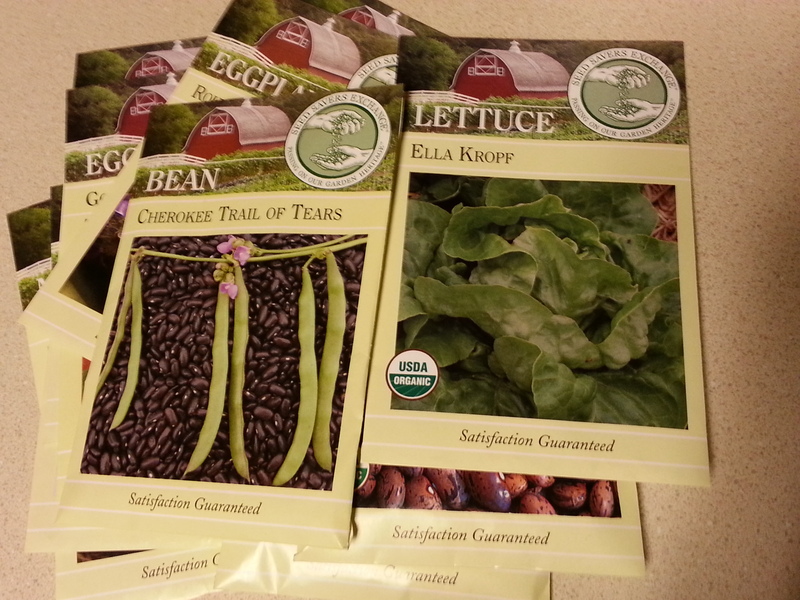 One of your best seed sources is going to be fellow gardeners. We all love to swap seeds. Look for a seed train. I found mine on Yahoo groups (I’m not sure it’s still active). For the price of postage you get a huge selection of hand saved seed. If you join one, be ready with your baggies and labeling (and have your contributions ready) before it arrives because it will be a lot of work. If you can’t find one, start one! You’ll find takers quickly. Our group split off and had several going at once because it takes so long to repackage and get through the list of excited gardeners. It was like Christmas morning for most of us! Unfortunately, it was totally random as far as knowing when the train would move from stop to stop and sometimes they would “derail” and we’d lose the package. That made for some very unhappy gardeners!! Seeds from my neighborhood plants (above) and from a wonderful seed train I was a part of for several years (below). 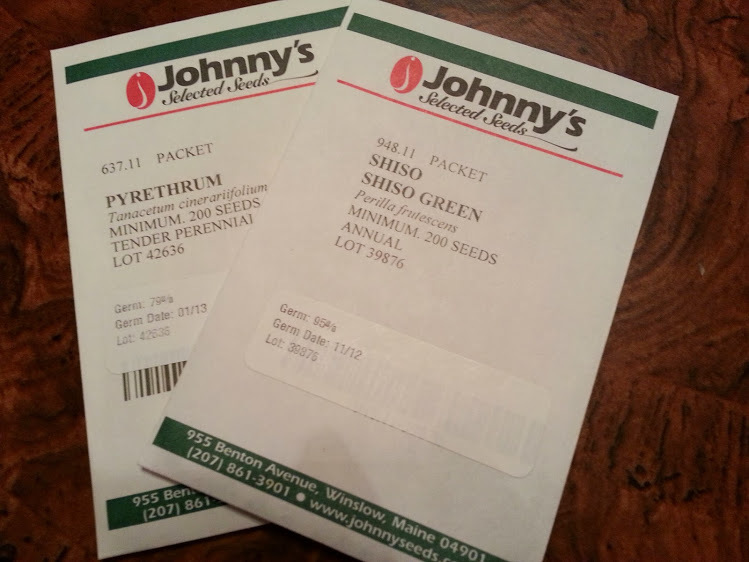 Johnny’s seeds: Great source for an enormous variety of seeds at a reasonable price. Sustainable seed company: No matter what you are growing this site has the most in depth information about it. Great place for information even if you don’t buy from them. Hazard’s seeds: You will not find a more extensive flower seed company than Hazard’s. Hazard’s sells mainly to commercial growers but they will sell to the public too. Just come armed with the kind of seed you are looking for or you will be lost in the thousands of varieties they sell. Seed Saver’s Exchange: This is really a very special site. They are the largest privately held heirloom genetic resource preservation site. You buy from them and you will be putting money towards genetic diversity. It is the opposite of those gmo companies we all run from. I can’t tell you how important I believe their work is. They are stingy with their seed though, so expect small packages. Raintree Nursery is a great place for exotic fruiting plants especially if you are NOT in the South. I have dealt with them for years and I have always been impressed. Raintree even hand canceled a large order from their shipping area when we had to move. I will always be a fan of this company because of that! Just Fruits and Exotics is the absolute best place to buy fruit plants from if you ARE in the South. I have gotten some fantastic plants. Really, a nice place for mail order fruits. 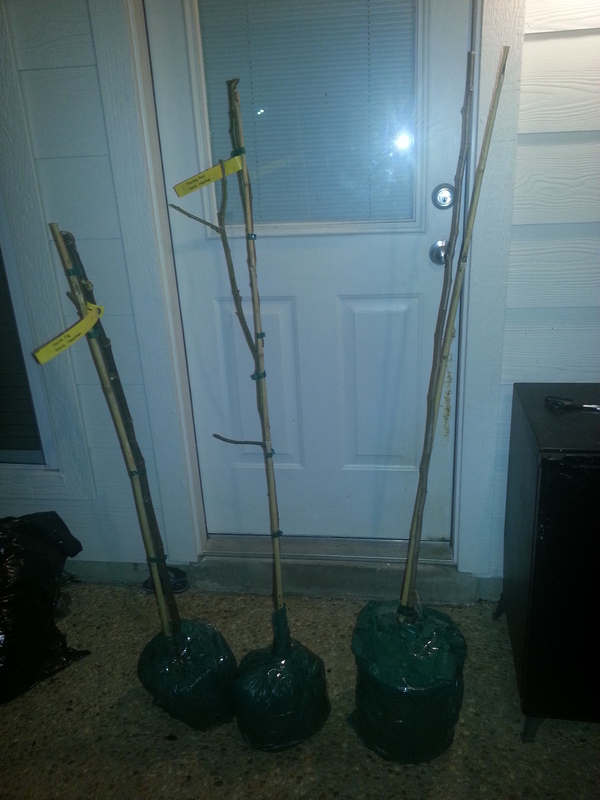 Beautiful mail order fruit trees from Just Fruits and Exotics. Outside Pride is where I like to get specialty ornamentals and wildflowers. High Country Gardens which just transferred hands and is a mess right now (as of Spring 2014) but hopefully they straighten out, is a wildflower and xeric plant company. I have ordered fantastic seed from them but I’ve always balked at their live plant shipping rates…but that’s just me. Morgan County Seeds: I saved the best for last! This is where I buy the bulk of my seeds. 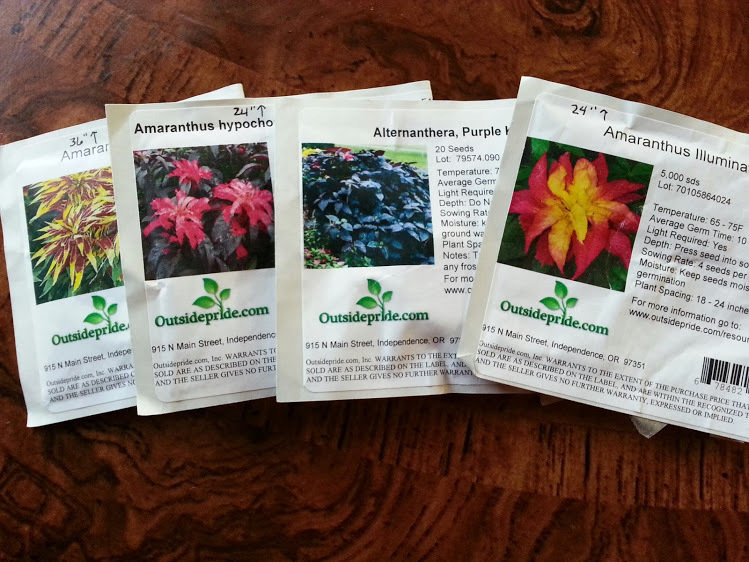 Incredibly inexpensive, very good quality seeds. I have used them for years. Love this site! I did the work for you. You will not find a better price for seed. If you are like me and buy a decent amount every season, this can save you substantially. I have personally dealt with all of these companies. I have many more I don’t plan on using again. I suggest looking on Dave’s garden and using their watchdog area to find companies with reliable histories. I use Dave’s garden a lot, but I think the site is bloated and hard to work with. However, it looks like they may have recently updated it and have started to clean it up. One of the most inclusive and user friendly sites is here: http://www.williams-sonoma.com/shop/agrarian-garden/agrarian-garden-plant-a-gram/ They have a variety of tools and information listed under agrarian. Look towards the bottom of the menu on the left to access them. Of course they should have a great site with the prices they charge for their products! It’s really well done and free so I do have to recommend the site. It covers pretty much anything you’d like to know on a variety of subjects including raising poultry. So there you go. Seed starting ideas, good sources and a personal warning for those of us who lean towards having addictive personalities. Have fun and remember that your failures of today are merely lessons for the future. Previous PostMaking sense of old sayingsNext PostMarch showers bring April flowers…and the specter of summer drought. so much helpful info! 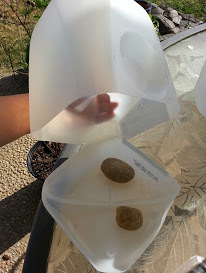 I love this post and now I;m inspired to try staring my seeds in jugs. Could I use soil blocks instead of peat pots? I use peat pots because they’re sterile and the netting keeps them separated. Gardening is completely experimental. 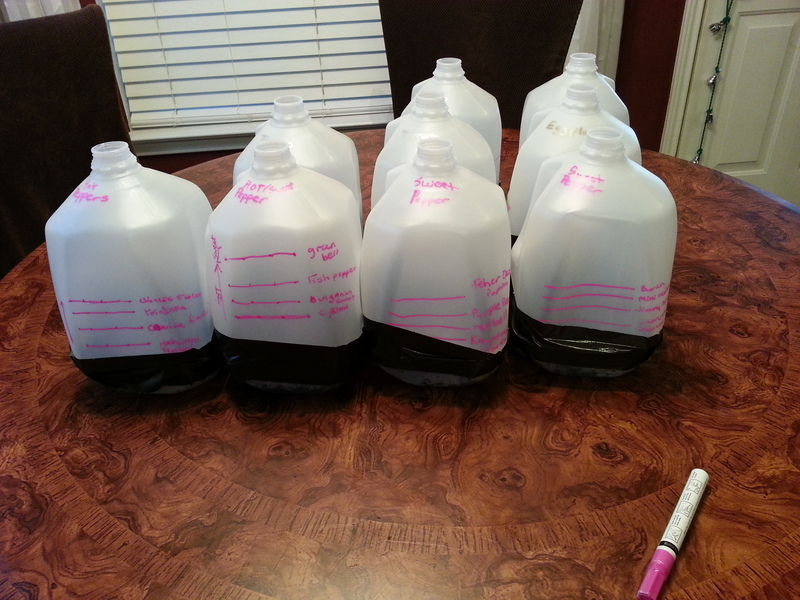 If you think what you have will work: try it as an experiment in only one of the jugs you use. If you like it: you’ll know next time you start seeds to use them in all of your jugs. If you find it becomes a total failure you’ve only lost the time and money for a single jug’s worth of plants. I buy peat pots and don’t stray from them because they work extremely well. Let me know how your experiment works out. Thank you for stopping by! If you haven’t begun seeding yet, Crazy Green Thumb’s well-written post will give you -literally – everything you need to know on how to get started. You’re welcome! It was a great post, and right on time! Wow, You really are a gardener. I have never seen these peat moss pots and I think they’re great. I have saved seeds over the years but mostly I give away or I just spread the seeds in my garden and hope for the best. Thank you so much! I appreciate it. I think I’m actually driven by laziness. I don’t want to go out and do anything twice if I don’t have to! That, and I have little kids. They make my goal of efficiency pretty laughable. Thank you for coming by!